April is National Stress Month. On a scale of 1-10 (with 10 being the worst,) the average amount of stress people feel is 5. This number is higher in women, Millennials and Generation X’ers. Although not all stress is bad, as it can motivate you to prepare or perform in certain activities such as job interviews, long term stress can harm your health. Chronic stress can suppress your body’s immune system, disrupt sleep and your digestive system, as well as your reproductive system. 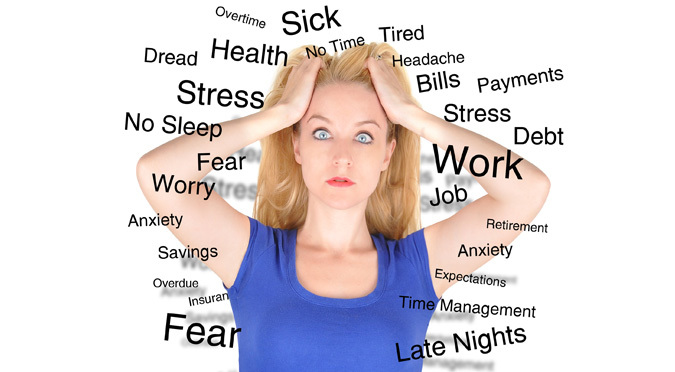 Stress can present a large variety of symptoms including headaches, insomnia, sadness, anger or irritability. People who are stressed come down with colds and flus more often then those who can control their stress. Overtime, prolonged stress can lead to serious health problems, such as heart disease, high blood pressure, and diabetes. It can also be a trigger for anxiety and depression. The bottom line is we all feel stressed at times, but if you are feeling overwhelmed with stress or cannot seem to get it under control it is time to take action before it harms you. Of course the best way to deal with stress is to get rid of the source, but that is not always possible or may take some time. Below are some things you can do to help lower stress and find some relief. Eat a healthy diet and drink plenty of water. Set a sleep schedule and stick to it. Food and sleep have a huge impact on our ability to perform in various activities and not taking care of yourself can lead to emotions that cause unnecessary stress. Practice meditation. There are many resources to help get you started, we recommend http://marc.ucla.edu/mindful-meditations for a free guided meditation you can download and put on your phone. Socialize. A recent study shows that being around friends lowers the stress hormone cortisol in your system. Write. Writing is a great way to get things out of your system and help clear your head. Seek professional help. Therapists or Psychologists can help you get to the source of your stress and give you coping techniques to help ease your mind.